That's the tour for this month. Next month, the bourse will again provide a broad cross section of coins, currency, bullion and other collectibles for visitors to view, buy, sell or trade with the dealers. Join us on Sunday, September 10, 2017, for the next Greater Atlanta Coin Show. The August 2017 Greater Atlanta Coin Show enjoyed a beautiful day outside and a fun-packed bourse inside with lots of visitors wandering the aisles to view, buy, sell and trade among the many collectibles on display. Some of our early morning visitors may have had difficulty finding a parking space due to the overnight guests from three (count 'em, three) weddings at the hotel the night before. By the end of the day, however, the parking lot was almost a ghost town. Generally, August in Hotlanta is almost unbearably hot and humid. For this show, the weather provided warm but bearable high-80s for the temperatures under sunshine and clouds. Inside, the coin show was busy, not quite as busy as the July show, with new and returning visitors interested in talking with the dealers and viewing their displays. Many of our regular dealers set up for this show while we also had a few visiting dealers with their collectibles on display as well. Of course, with the metals' prices bumping up and down, people also came to look for bullion - coins, rounds and bars. By the way, have you heard of a ferroequinologist? One of the gentlemen at the show offered a business card with that as his title. Think about it a minute. From the periodic tables, "ferro" is another term for iron while "equin[e]" is horse and "ology" is the study of. Now, every dictionary may not show that term, but many online references do. In summary, a ferroequinologist enjoys trains and railroads. How's that for the "learn something new every day" adage? Now, for a small view into the bourse. Each month the bourse offers a wide variety of numismatics from ancient to colonial to modern day, foreign and domestic, metal and paper, highly valuable and modestly priced, but it also offers other collectibles, too. This month, let's start the brief tour with a non-numismatic item that could prove interesting to ferroequinologists. This collectible model train is a pre-war Lionel Train with engine 259E. "During the Great Depression, Lionel's sales and profits slumped, and 1931 was its first year in the red. Ironically, as times grew tougher, the company introduced its greatest standard-gauge steam locomotive, the No. 400E, whose $42.50 price was beyond the means of most families. "In 1934, financial troubles led Lionel into court-ordered receivership to stave off bankruptcy. "That year the company's fortunes were boosted by the debut of the wildly popular Mickey and Minnie handcar, a $1 windup toy. Lionel showed profits again in 1935, and the receivership was discharged. It also marked the ascendancy of affordable O gauge over the more expensive standard gauge, which was discontinued in 1939. "Lionel benefited financially from defense production during World War II, but toy train production was put on hold. So boys (and their dads) were encouraged to 'plan your postwar railroad' in Lionel's Model Builder magazine and Railroad Planning Book." One online train enthusiast website noted for the 259E: "The first issue was 1933-1934 in Gloss Black, also made 1936-1938, and additionally in 1939-1940. Some, but not all 1934 issues had a misspelled Gauge on the bottom pickup as GUAGE, which would definitely put it at 1934. 1936 issue were Satin Black; also in Gunmetal Gray. The 1937 'uncatalogued' issue was Flat Black." This particular train appears to have its original paint and could be the "flat black" issue of the 1930s. It's wear and patina makes one wonder about who enjoyed this train and the pleasurable times it provided through the years. For the ferroequinologists, the Olsen Toy website provides interesting diagrams for the Lionel 259E and its tender. 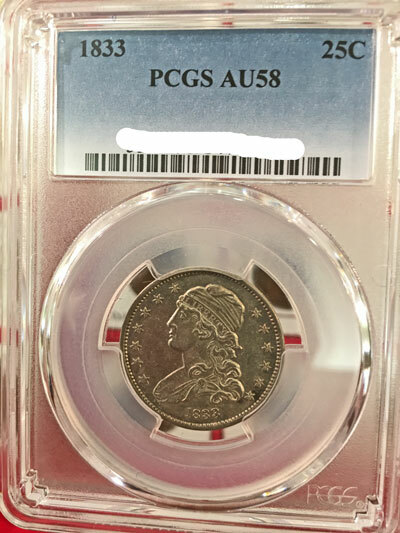 Next is a numismatic collectible from 1833, a capped bust quarter dollar coin graded by PCGS as AU58. The draped bust quarter dollar ended in 1807. After several years of not striking quarters, the Mint began the Capped Bust quarter in 1815. At that time, the diameter of the 1815 quarter remained at 27mm, slightly larger than today's circulating dollar coins. In 1831, the diameter of the quarter dollar reduced to 24.3mm, the same size as today's quarter coins. In addition, the Mint removed the "E Pluribus Unum" motto from the reverse of the coin. "Has some signs of abrasion: top of cap, stars and hair above ear and at forehead; eagle's claws, arrows and edges of wings." "The type collector has their choice of any date from 1831 to 1838, as all are priced approximately the same in the market, although certain dates, 1835 in particular, are more plentiful than others. "Examples are readily found in grades from Very Good through Extremely Fine. AU and Uncirculated pieces, though more expensive, should pose no problem if one wishes to acquire one. "Superb Uncirculated pieces, like all early 19th century issues, are rare and costly." Though not a "Mint State (MS)" graded coin, this specimen is a fine example of 1833 Capped Bust Quarter Dollar coins. The next coin is a variety of the Indian Head or Buffalo nickel coin minted in 1935 at the Denver mint. 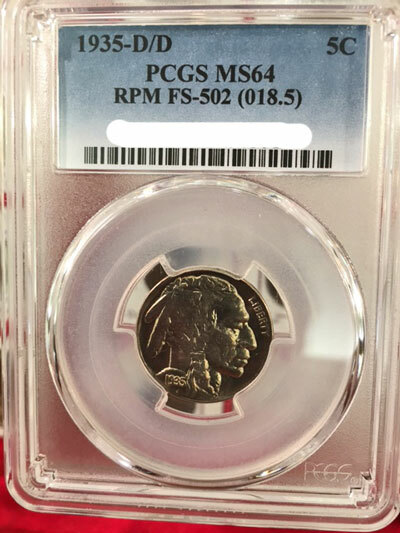 PCGS graded this five-cent coin as MS-64. 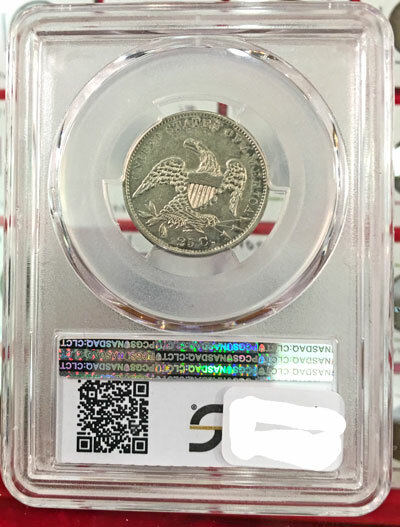 On the PCGS website , they show they have graded 33 coins of this particular variety with only three of them in Mint State with one each graded to be in MS-62, MS-63 and MS-64 condition. In other words, this specimen is the highest grade by PCGS for this doubled variety. "This is, without a doubt, one of the nicer re-punched mintmarks of this series. There are at least four mintmark punches, with two to the west and one to the east of the primary mintmark." Question: how did the Mint strike this coin's mintmark four different times without dramatically changing the main design? Next on the tour is a recent modern collectible from the US Mint. Coinciding with the early August ANA coin show, the Mint released a special edition uncirculated coin set. 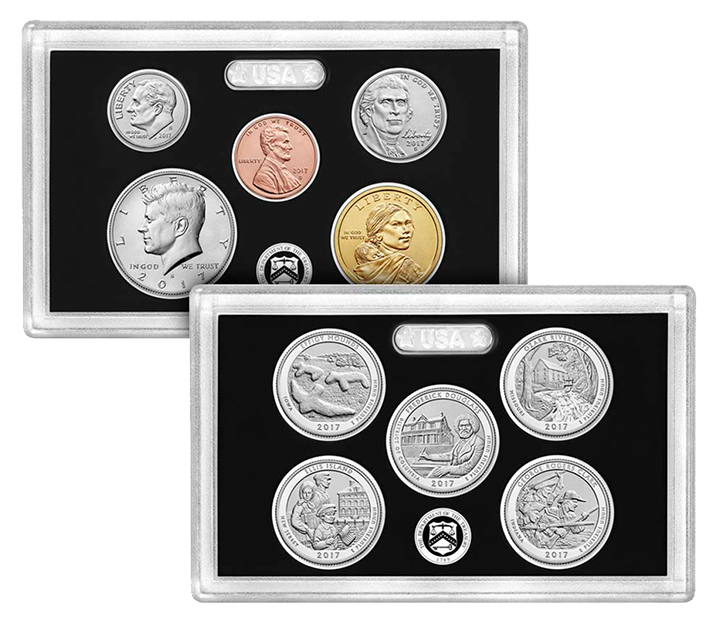 Normally, uncirculated coin sets, popularly known as mint sets, contain two of each of the coins, one complete set from the Philadelphia mint and one set from the Denver mint. 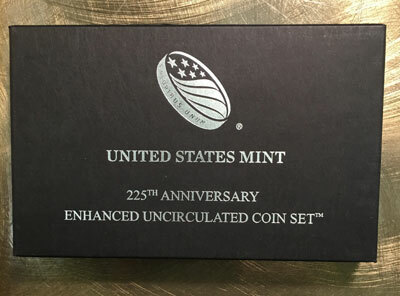 "Struck in celebration of the Mint’s 225th anniversary, this set contains 10 coins with an enhanced uncirculated finish featuring a combination of laser-frosted areas and an unpolished field that accentuates design details. 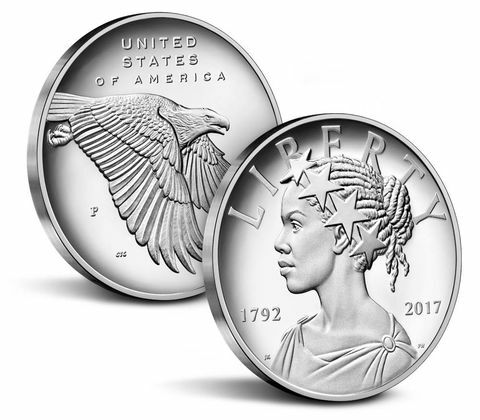 "The process creates a unique contrast distinctly different from the mirror-like finish of proof coins. "Each coin bears the 'S' mint mark of the United States Mint at San Francisco." The set of 2017 coins contained the five America the Beautiful quarters, one Native American dollar coin, one Kennedy half dollar, one Roosevelt dime, one Jefferson nickel and one Lincoln cent. In addition, the US Mint noted, "The coins are presented in two coin lenses-five coins per lens-and packaged in a black matte box with a Certificate of Authenticity. Mintage for this set is limited to 225,000 units." Only a week or so after initial sales, this set made its way to the August bourse. From overheard comments, people are not sure they like this set's laser-frosted finish and its proof-like mintmark and packaging. Time will tell if this collectible holds interest and value in the numismatic marketplace. 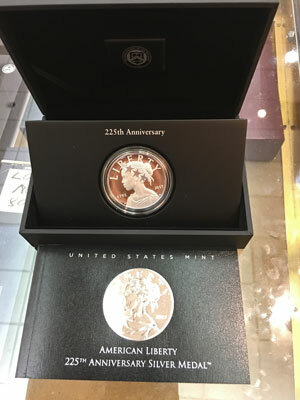 The US Mint also produced the next item in celebration of their 225th anniversary, however it is a medal rather than a coin. "The Mint is issuing this one-ounce proof medal in celebration of its 225th anniversary this year. "Struck in 99.9 percent silver at the Philadelphia Mint, it is the medallic counterpart to the gold coin released earlier this year featuring a modern rendition of Liberty. "Each medal is hand packaged in an exquisite, black matte finish presentation case and is accompanied by a companion booklet detailing the evolution of our Nation’s symbol." "Emblematic figures of liberty have graced US coins and medals since the founding of the United States Mint 225 years ago. "Our newest Liberty features a modern rendition of this iconic figure and embodies the ideals of freedom and equality first set forth in our Declaration of Independence." Available since June, this specimen is one of the first seen on the Greater Atlanta Coin Show's bourse. 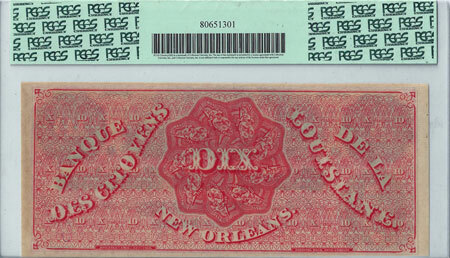 The next and the last item on our virtual tour is a collectible obsolete currency called the "Dix" note from Louisiana. "Louisiana’s banking laws were sound, and the state’s bank notes were respected. 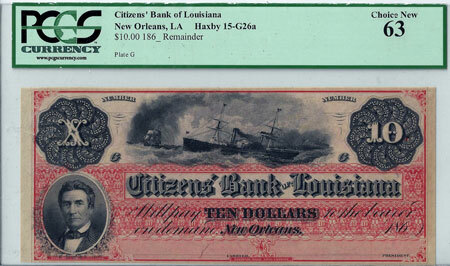 'Dix notes' from the Citizens Bank of Louisiana were widely known. The $10 notes used the French word for ten, 'dix,' on the back. These popular dix notes may have led to the term 'Dixieland.'" This particular note has a reference number of Haxby 15-G26a. James Haxby compiled a Standard Catalog of United States Obsolete Bank Notes 1782-1866. The 15-G26a is widely recognized as the "Dix" note. - No serial #. Remainder. - Central vignette of the U.S.S. Adriatic at sea surrounded by other ships. - Red/orange "BANQUE DES LA LOUISIANA & DES CITOYENS" (Citizens Bank of Louisiana-French) coupled with "DIX" (TEN) and "NEW ORLEANS" upon very ornate back. - This note cost a good sum of money to produce in its day due to the enormous quantity of red ink utilized. I would imagine the skill required to engrave and print the note was not inexpensive as well. One of the most famous and beautiful obsolete bank notes extant. - Well grounded opinion is that the word "DIX" upon the back of this very note gave rise to the use of the term "Dixie" as the nickname for the Southern United States. - Simply an incredible work of art and produced by the National Bank Note Company. - Cherished by many for it's extremely intricate, geometric design work and color. I could not fathom anything remotely close to this being produced today. Razor sharp corners and superb trim. - The "Dix" was printed upon high quality paper which contained purple, blue and non colored fiber. - A classic case wherein the note looks much brighter and more colorful in person than in the scan. - On occasion, the Dix is seen housed in a PMG or PCGS Unc 64 or 65 holder; although very rarely encountered bearing an assigned grade of Gem Uncirculated 66. - If you seek the very best, you need look no further. Simply an incredible work of art and of unquestionable quality. Oh, if only this note could tell the tales of its travels around the "Dixieland" of the 19th century.